The Juneau Raptor Center (JRC) is a volunteer, non-profit organization serving Southeast Alaska since 1987. JRC provides medical care to over 150 sick and injured raptors and other birds each year. JRC also delivers educational programs, featuring non-releasable birds, to local and regional groups, teaching audiences of all ages the basics of conservation. By the time tourist season is in full swing, Lady Baltimore will have a sweet summer home to show off. 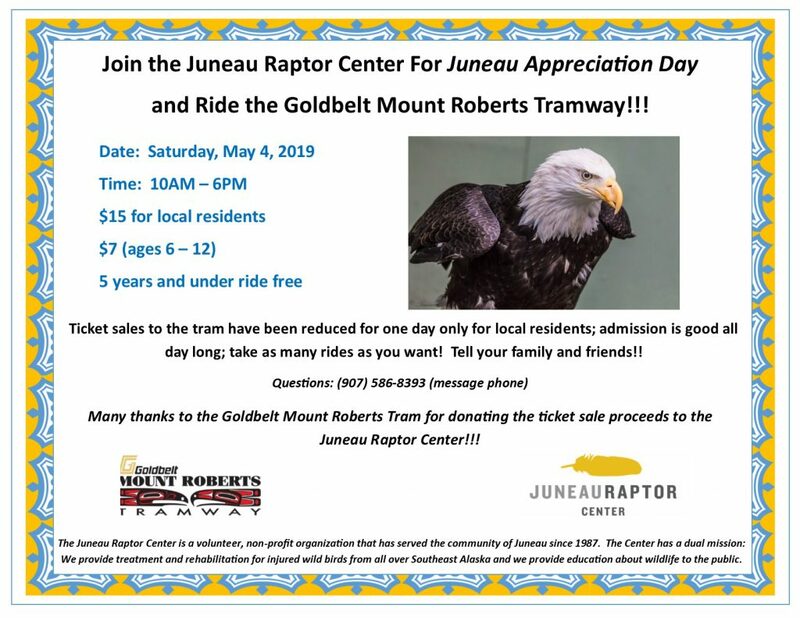 The non-releasable American bald eagle, who is blind in one eye and has an injured wing, spends spring and summer months in an educational display at the Goldbelt Mount Roberts Tramway on Mount Roberts that is maintained by Juneau Raptor Center. By late April she’ll have a new $170,000 display as her seasonal home. Please note article misquoted Lady Baltimore’s weight as 40 pounds instead of 14. Please consider donating a portion of your PFD to the Juneau Raptor Center and help us in our mission to provide the best possible rehabilitation care to the many birds throughout Southeast Alaska and provide education to the public. Although applications were due March 31, 2019, Alaskans may choose to add or adjust their pledges online through August 31, 2019. Big or small, your contribution helps us care for 100+ injured and/or sick birds each year and allows us to provide education to our youth. 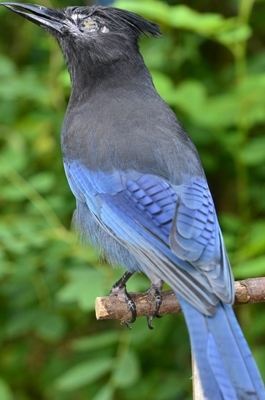 It is with a heavy heart that we announce the passing of our education Steller’s Jay. Bebop came to us from Cordova in 2010. He was injured when he collided with a car and sustained damage to his eyes from the grit on the road surface. He was left blind and his beak was permanently mis-aligned. Bebop was an amazing ambassador for his species, attending education programs in classrooms and other venues throughout Juneau. He was always alert and interested in his surroundings. He loved to sing and play on his bird gym, excitedly jumping up and down when he knew he would get to leave his enclosure. He will be greatly missed by all who had the pleasure to know him. We got a call from the USCG on January 29th. 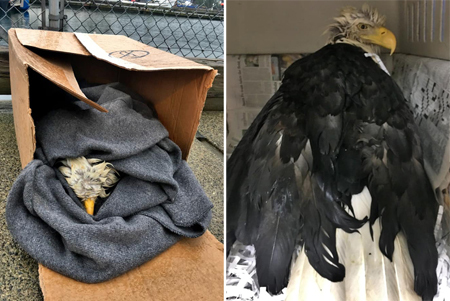 They scooped this Adult Bald Eagle out of the water at Statter Harbor in Auke Bay after finding him floating face down. They wrapped him up and kept him warm until we arrived. After examining him at the clinic and finding no injuries, we placed him in a kennel with warm air to dry out his feathers. This eagle is no stranger to JRC. He is banded and after doing a little research, we discovered that he was a patient from 2014 who was rescued and released the same day after getting tangled in fishing line. 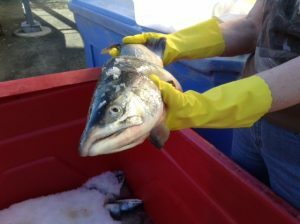 He was sent to Sitka for further treatment. Many thanks to Cody and crew from the USCG vessel “Liberty” for saving this beautiful bird. Update: The eagle has been moved to the flight conditioning enclosure and continues to improve. Make a year-end donation now for a great start to 2019! Getting the party started!! 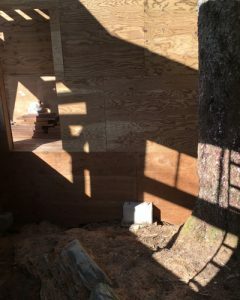 Here are some recent photos of the mew site on Mount Roberts. The old structure is completely gone and site prep is underway. 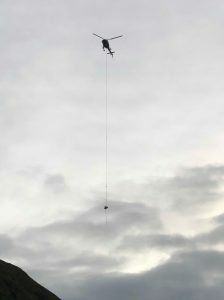 Materials were dropped in by helicopter last week! We’re on our way! Here we go! 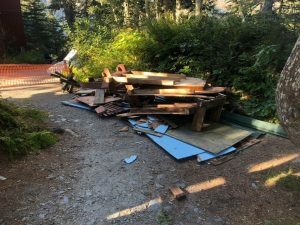 The deconstruction of the old eagle mew on Mount Roberts has begun. 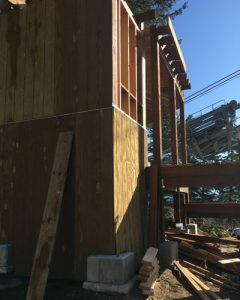 The great folks at Silverbow Construction have been hard at work dismantling the old structure for removal. 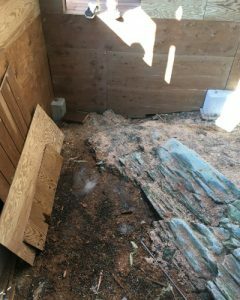 After that happens, they will be able to begin site prep for the new mew, scheduled to be ready next spring!We’re still in need of food donations for the GCI crew who will be removing the old material and hauling it away. If you can donate a pizza, sandwiches, bottled water or snacks on Saturday, 9/29, please leave us a message or call the office at 586-8393. Whoopee! 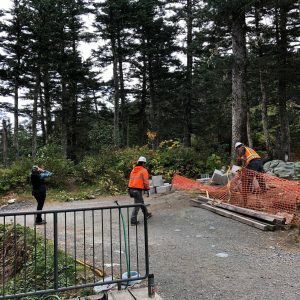 Deconstruction & removal of old mew on Mount Roberts! 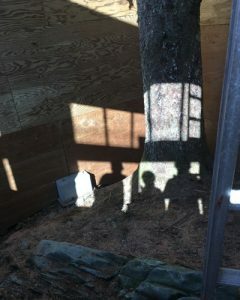 September 29th is the day we bid adieu to the old mew on Mount Roberts. 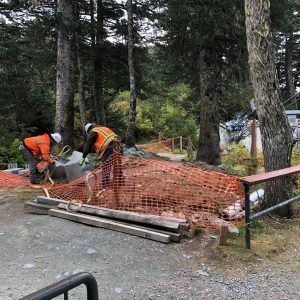 The Juneau Raptor Center wishes to thank GCI for providing the labor force to help us in honor of the 2018 Day of Caring! We need volunteers to help feed the workers. If you can bring a pizza, bottled water, sub sandwiches, snacks, or fruit to the tram on the 29th, we would be so grateful! Also, we could use paper plates and napkins. 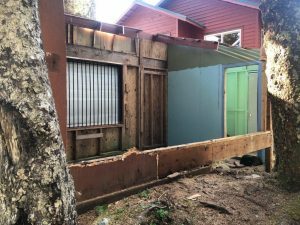 Once the old material is gone, Silverbow Construction will be able to attend to site prep for the new construction, weather permitting. (translation: snow). Look forward to the new mew next spring! If you can help feed the crew on September 29th, please contact JRC at info@juneauraptorcenter.org or call us at 586-8393. There’s No Place Like a New Home! 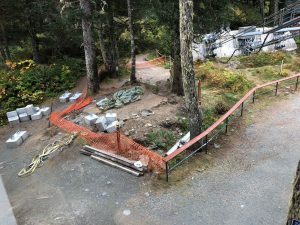 For many years, the Juneau Raptor Center has hosted an education eagle display on Mount Roberts during the visitor season. Though there were several education birds before her, the current star of this attraction is Lady Baltimore, a non-releasable American Bald Eagle who is blind in one eye with a damaged wing. Being unable to fly and see properly, ‘Lady B’ would have been hard-pressed to survive in the wild. Since her injuries healed, she has been cared for like the princess she is by JRC board members and volunteers. Her summer housing is old and in need of replacement. The access and visibility are poor. And, it would be ideal to give her a bit more room to stretch out. Juneau visitors want the opportunity to see a live American Bald Eagle up close. It’s an educational experience not available in many other places. The solution is simple: build Lady B a new home! 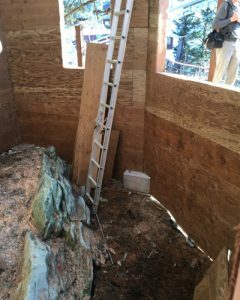 For some time, the Juneau Raptor Center has been on a mission to build a new eagle mew on Mount Roberts. 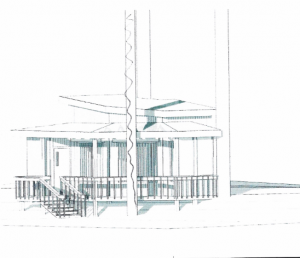 Now, thanks to financial support from Goldbelt, and the architectural expertise of Jensen Yorba Lott, that is becoming as reality. Starting September 16th, the existing mew will be dismantled. By the end of September, the goal is to haul away all the old material so new housing construction can begin. 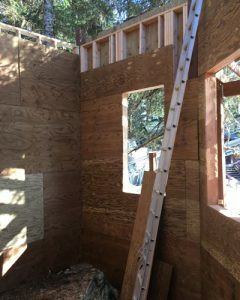 In 2019, you can visit Lady B in her new digs which will be expertly built by Silverbow Construction! It will be a beautiful, brand-new enclosure with greater visibility, better ADA access, and more room for Lady Baltimore to move around. We are very excited to get this project underway and are looking forward to next season and a new home for our favorite eagle! Thanks again to the continuing generosity of Taku Fisheries, the Juneau Raptor Center’s permanent and rehabilitating eagles will be eating freshly caught, processed and stored pink salmon for the coming year. 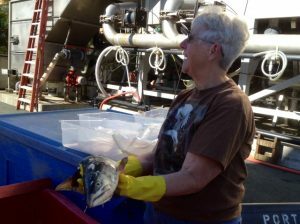 Many thanks to Eric Norman and his crew for all their help in providing these fish for our birds. Your help all these years is greatly appreciated and makes it possible to feed the eagles their preferred food. We are very grateful to all of you! Adopting a JRC Education Bird allows you to directly contribute money used to feed, house and provide medical support for that bird. Education birds are a vital part of the JRC’s mission and your support allows us to reach more people. We are now offering our newsletter to our membership electronically. We want to help preserve the environment by using less paper and maintain overhead by lowering postage costs. We will continue to provide the newsletter via U.S. Mail for those who prefer to receive it that way. 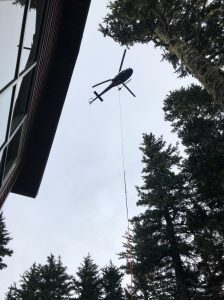 Please contact us via our web site email: info@juneauraptorcenter.org if you wish to receive the newsletter electronically or if you have any questions.